I know that, around here, I'm going to be all dog all the time for a while. If you write what you're experiencing and what you're experiencing at the moment is a throwback to an old Dunkin' Donuts commercial (Time to walk the dog), then that's what you'll be writing about. Today I texted the dog walker to let her know that I'd left the dog in his crate with two fans but no AC, would she please let me know if she thought he needed AC as the temps will continue to be high for a few days. I get texts instead of written notes with my dog walking because I can't wait until I get home to get my 2 sentence evaluation of Eddie's midday meetup. Did I mention that, while I have sprung for dog professional dog walking 5 days a week, I'm getting the cheapest/shortest walk there is. And yet I am THAT CLIENT, the high maintenance one. The one who adopts a dog while you're on your first vacation in two years and insists on getting him walked by your company. Someone said to me this weekend, "Don't worry. Just focus on this time next month. It'll all be simpler and easier in a month." And I replied, quite honestly, "A month? Wow, I'm actually looking at this time next year. By then things will have evened out." He's a young dog, training is a slow process, why get my hopes up, you know? A month will be better but how much better? In a year we'll have a groove for sure and if we don't I'll have no one to blame but myself. That being said he's a very good dog already. I really hope that someone isn't out there missing him and unable to find him, because I think they did put in a lot of time helping him to be a good citizen. He doesn't chew things he's not supposed to, he waits when told, he brings his leash when he wants to go for a walk, he doesn't jump up on people and, frankly, he's awfully good company. The cats mileage may vary on that last one but even they seem to be softening toward the little ball of whine. Sure, they still hiss and swipe at him but their jabs seem perfunctory, they certainly aren't aimed to kill. I've gotten in the way of those before, they aren't pretty. His feelings aren't hurt. They can swipe and jab all they want, he'll still come back in a few minutes to see if they've changed their minds. 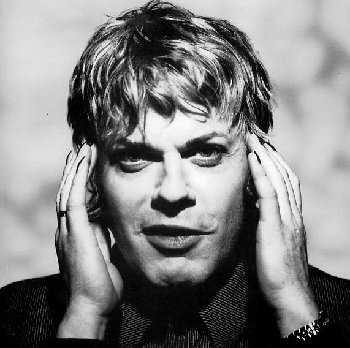 Waiting in line to get in to see Eddie Izzard a couple of weeks ago I had that pang you get. My brain whispered to me, "You should be ashamed of yourself leaving that poor new dog home alone. He gets lonely." I was in line to see Eddie Izzard, Eddie Motherfucking Izzard, and I still had that pang. Which is why you'll never catch me making fun of someone who cries when they drop a kid off at school. He brings his leash when he wants to go for a walk? Aw! Need video... but then you'd have to know he wanted a walk, in which case you'd already be out the door. "Blah, blah, blah, dog, blah, blah, blah...EDDIE MOTHERFUCKING IZZARD." So glad to hear Eddie is a good citizen!! Our Jack is too - the boy knows what "heel" means, even though he was a stray on the mean streets of Highland Park in LA. Crate training is definitely the way to go, as you don't need to be told. Hope the dog walking is working out. We have a neighbor who just adores Jack and walks him just because she wants to sometimes! When we travel, we board Jack at a local kennel owned by friends of the family. The dogs get to run in a big field here in the Santa Monica Mountains. They adore him! Ooh. That reminds me. I need to make Jack's reservation for our trip to Seattle later next month.